-and hold up in a tiny mobile home (that flexes when it moves)! But we did it! We were this close to giving up and building an outdoor shower. In the end, the shower enclosure was made of aluminum and stainless steel with a zero VOC adhesive. The details are below, but first, some plans that didn't work (but may work in a non-mobile home). My first plan was tiles, but grout without additives (plain Portland Cement) may not hold up in the long-run to mould or to cracks in a mobile house. Even with the recommend Schulter shower system, I still wasn't confident the area around the drain would hold up to cracks when the house moved. This would be better in a non mobile home. A non-toxic waterproof finish, tadelakt was also considered. However, all the plaster in my house has cracked. Some ideas to give it a little flex include - adding glue to the plaster and maybe a mesh underneath on the wall, but no one has tried this yet in a mobile home so it is a big risk and I don't think it's a good idea. In a regular house (not on a trailer) this would be a good choice for many. Though it requires a lot of upkeep. (For the base/floor you still need tiles, fiberglass or metal). These will last a lifetime without getting mouldy but if you get a company to install it they need to use their own adhesive, which is hugely toxic. Fiberglass offgasses and most highly sensitive people say they react to it. Acrylic is much more tolerable and should become odourles quite quickly. If you use one of these showers you have to design the size of the bathroom around that (we didn't).You can offgass them outside until they are ready. Use AFM Almighty Adhesive to install them. Solid surfance showers are beautiful and non-toxic but I have not found one with a non-toxic glue. In a regular house, polished concrete might work really well, if you can find someone who can do that finish on walls and tight spaces. Glass walls are something to consider. Plastic walls can also be used. An outdoor shower could be made of cedar, glass or concrete. 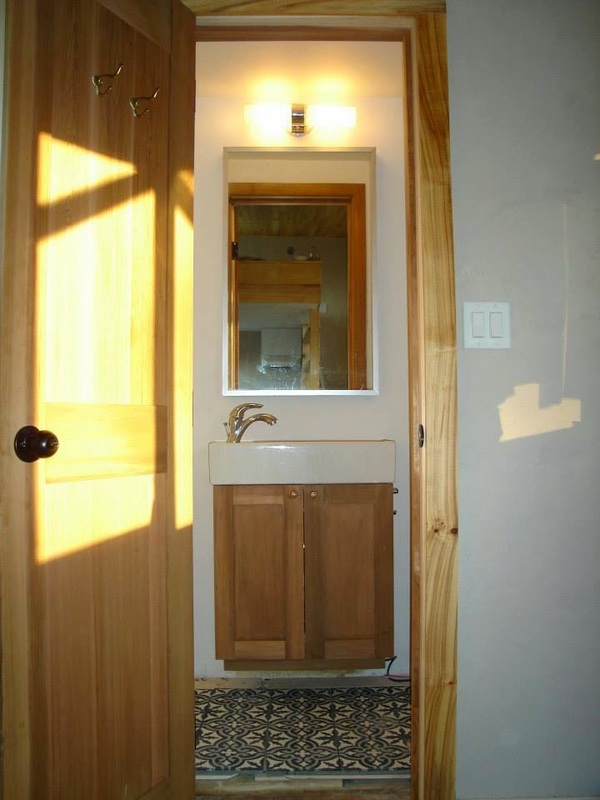 More discussion on these materials in my post on bathrooms. A basin with 2-inch sides is made of stainless steel and the pipe in the center is welded in so will never leak around the drain (Stainless is going to hold up better than aluminum in the basin). I would have done more of a grade and a higher lip on the basin if I did it again. Underneath we used pieces of acrylic and Butyl Sealant Tape to support the grade. There are two sheets of thin aluminum panels that wrap around the three-wall shower enclosure. The first piece of aluminum wraps around the three walls (no seams in the corners) and overlaps with the basin at the bottom (will never leak at that point). The second piece of aluminum overlaps over the first piece and goes up to the ceiling. A vent is right in the middle of the shower on the ceiling to reduce moisture. I am wondering if I should have had a piece of aluminum made for the ceiling as well. After testing many adhesives with no luck I finally found Almighty Adhesive by AFM and had no reaction at all to it even when wet! The problem of finding an adhesive was holding up the project for months and I was so excited to finally find this. It is also the only adhesive (including silicones) I have ever smelled that really is non-toxic. Even a regular non-toxic white glue smells more than this stuff. Around the edge of the aluminum will be sealed with AFM caulk which does take about a week to offgas. I really want all the edges to be sealed. Strangely (happily) I no longer find this caulking to be problematic but I think EcoBond is less toxic. So there you have it! A shower that will never leak or become mouldy and with no toxins! I have to thank the guys at BathMaster because they spent weeks problem solving this, designing the shower, and getting it custom made. They were willing to do whatever needed to be done to get me a shower I could tolerate. Once thing I would have done differently is not use any batting insulation in the bathroom walls. If moisture gets into the walls then it's over in terms of mould. I would have used only hard foam. Another thing to consider is to weld all the parts together. See Tiny Green Cabins stainless steel showers if you are interested in that route. THANK YOU THANK YOU THANK YOU!!! I've just discovered your blog, and after hours of research to find a light-weight nontoxic way to build a shower, reading this particular blog post made me very happy. I was not looking forward to all of the testing-and-getting-sick that the build process would cause me. I know we each react a bit differently (we canaries in the coal mine), but you've given me a lot of great ideas, and a place to start. Thank you!! I am having a horrid time trying to repair the walls of a shower. Only about 5 feet from the top top needs to be replaced the rest is intact tile. Your aluminum panels sound great where did you buy them / what manufacturer? Did you have a backerboard? if so what kind? how did you attach it? adhesive? what kind? I made a shower curtain made from a fine vintage cotton percale sheet. Works great and to clean I just wash it with the bed linens. If you can't fine vintage, use an organic cotton fine woven sheet. We love this idea! What did you use to seal the aluminum and make it that nice and shiny white? you can buy the aluminum already coated. I believe it offgasses very quickly once cured. My husband and 1 year old son are allergic to mold, my son especially. We are planning on building a non-toxic mold resistant tiny house next year. Do you have and suggestions for a shower tub combo for a tiny house, having a little one and hoping to have more, I'd really like to have a tub option as well. I don't know of any in particular but I have seen tiny club claw tubs which are really cute. I have also seen people make their own with large metal basins. I would love to know the price the rest of us should expect to pay for a job like this. The cost is at the bottom of the post! I have a question about plumbing, particularly tub sputs, shower heads, valvs, etc. I was hoping I maybe missed it somewhere in your article, but I didn't see this topic brought up. I recently stumbled upon some disappointing news about plumbing containing high amounts of lead in it. Brass especially will have lead in it. I called over 20 companies and all admitted to using lead in their products. A few articles I came across about this topic made mention that the lead from the plumbing leeches into the water supply. The US government has a "standard " where no more than 11ppb of lead is allowed to be leached into the water, but that's only in the kitchen, where they deem the water "drinkable." Currently, there are no standards for bathroom appliances, so even more lead is found in those fixtures. What are your thoughts on this? I wanted to give my son detox baths, but don't feel comfortable doing so with all that lead content in the water. I am very anxious bc of how many toxins are being found in so may things. Any info will help, no one seems to have answers. And I don't want plastic spouts or shower heads. I love all your articles! Check out this article https://www.safeplumbing.org/health-safety/lead-in-plumbing maybe test your bathroom water for lead and then put in a carbon block filter. That site offered limited help; they did not direct me to actual companies. It took me some time, but I was able to track down an American based company that made solid 304 stainless steel bathroom plumbing fixtures. There were a few companies that made kitchen fixtures out of stainless steel, but to find a company that included bathrooms was almost impossible. They do use a little bit of plastic in their showerhead though (vents) and not sure about spouts bc I am still waiting to hear back. They use ceramic valves. There is a Chinese and Italian company as well; the Italian company seems to be the most pure but it costs thousands of dollars! As far as carbon block filters, do you know if they make them for tub spouts? I would put in a shower filter and fill up the tub that way. Hi Ana, would you share with us the companies that make lead free faucets? Parmir out of San Diego makes 100% lead-free stainless plumbing fixtures. Even the flexible shower hose tubes are silicone, which is incredible--try finding PVC-free tubes anywhere!!! We are using their products exclusively in our home remodel--kitchen, lavatory and shower/tubs. What size is your shower and what size curtain did you get?